After reading Mike Davies’ story on open textbooks this issue, I wondered what the future of post-secondary education might look like if a model like this is not ignored. The move towards open textbooks is a step that no educator should be afraid to take. On the horizon of post-secondary education are things that do not even resemble modern academia. There are no textbook deals, there are no major worries over tuition and there’s barely even a university campus. So what am I talking about? Well, a number of things. First, there’s the MOOC. The massive open online course. These courses are wildly successful, in some regards, and struggling in others. 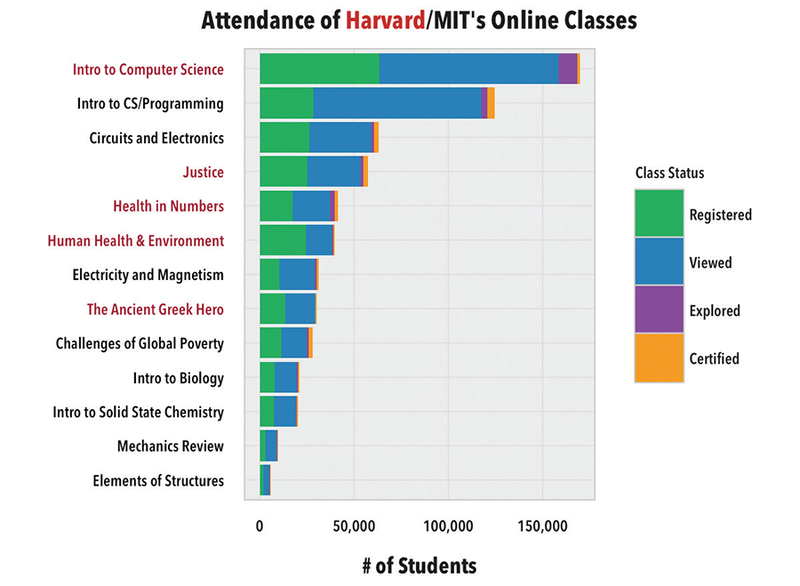 Harvard and MIT teamed up to release data on 476,532 students (that’s the “massive” part) who had participated in free MOOC courses in the 2013 academic year. Data compiled by San Francisco software engineer Max Woolf shows that completion rates across the 13 free courses were around just three per cent. Woolf said this is likely explained by people signing up “just for fun.” He’s probably right. They’re free, after all. But the poor completion rates shouldn’t be anything to worry about, and the sheer numbers of signups alone should indicate to educators that the interest is there on a scale that is massive indeed. Increasing completion rates can always be things to work on in the future. 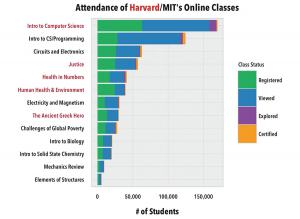 The fact that Harvard offers its Intro to Computer Science course for free online makes me hopeful for the future of accessible education. It serves as a statement that the most important part of post-secondary is that people are being educated. When I look at universities who never seem to stop talking about money, I find it pretty difficult to remember that students should only be there to learn and educators should only be there to teach. Of course there are economic realities that keep this from happening, but it should be every administrator’s responsibility to minimize that as much as possible. MOOCs might not be the solution, but they’re a giant leap in the right direction – one you don’t see many universities taking, and really, I don’t blame them. The decision to start giving it all away for free is a very difficult thing to go back on, and once you start, your success might even hurt you. So, forget the giant leap. Let’s try a baby step. How about open textbooks? The widespread adoption of open textbooks would not only alleviate a huge financial burden on already cash-starved students, but it would serve as a bellwether for post-secondary education. The direction towards open and accessible education would be undeniable. The proportion of Canadians acquiring a university degree has doubled since 1990. In 2012, it was 22.1 per cent according to Statistics Canada. If this trend continues and accessibility to post-secondary education becomes even more important, does the traditional model sound like it would work? To me, it doesn’t. Should the purchase of a $150 textbook really be the deciding factor of a student’s performance? Should textbook companies really be treating professors like targets for a big sale? The professor-textbook company relationship almost reminds me of the relationship between pharmaceutical companies and doctors. When they make a deal, the mutual benefit is clear, but there’s a third party whose interests might not be respected like they should: the patient. The student may be equally left out of the deal when a textbook choice is made. Did the professor choose the textbook based on its quality, or was it the swathe of proprietary test banks and supplementary material that sold the book? Students shouldn’t have to worry about backroom deals made before they even arrived on campus. At the very least, they should know what to expect from their learning materials, and with open textbooks, that’s very easy.